The deadline for submitting nominations for the Agribusiness Leader and NAMA Marketer of the Year awards is this Friday, January 15, 2010. 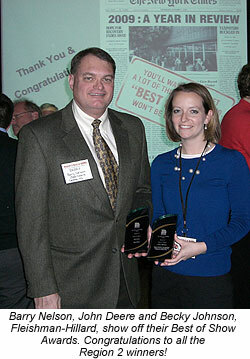 Both awards will be presented at the 2010 Agri-Marketing Conference, April 21-23, in Kansas City, Missouri. Fill out the nomination form on-line now at http://www.nama.org/awards/agribusinessform.htm. Or download the Agribusiness Leader Nomination form in an Adobe PDF format by visiting, http://www.nama.org/awards/agbusapplication.pdf. Fill out the nomination form on-line now at http://www.nama.org/awards/namamarketerform.htm or download the NAMA Marketer of the Year nomination form in an Adobe PDF format by visiting, http://www.nama.org/awards/mktrapplication.pdf. There’s still time to register for a Best of NAMA ceremony near you! The following regions and chapters will be hosting events. The Region III Best of NAMA ceremony will take place on January 14, 2010, at the Varsity Theater in Minneapolis, MN. Cost for the event is $70. The program will begin with a reception at 5:30 p.m., followed by dinner at 6:30 p.m. and the awards presentation at 7:30 p.m.
To register for the Region III Best of NAMA ceremony visit http://www.nama.org/ConferenceRegistration/Default.aspx?confid=10. Rooms are being held at the Radisson University Hotel, 615 Washington Ave., SE, Minneapolis, MN 55414. Call 1-800-395-7046 to make your reservations. Make sure you mention NAMA to receive the $99 rate. For more information visit www.nama.org/amc/bon/region3.htm. The Region IV Best of NAMA ceremony will take place on January 21, 2010, at the Crowne Plaza Hotel in Madison, WI. The cost of this event is $65. The program will begin with a reception at 6:00 p.m., followed by dinner at 7:00 p.m. and the awards presentation at 8:00 p.m.
To register for the Region IV Best of NAMA ceremony visit http://www.nama.org/ConferenceRegistration/Default.aspx?confid=11. You can make hotel reservations at the Crowne Plaze by calling 800-404-7630. Make sure you mention “NAMA” to get the special rate of $104. For the latest information on the Region IV Banquet visit www.nama.org/amc/bon/region4.htm. The Carolinas/Virginia NAMA chapter will hold their Best of NAMA event at the Chatham Hill Winery in Morrisville, NC. There will be wine tasting reception at 5:30 p.m., followed by dinner and the awards program. More information on this event will be coming soon…stay tuned to www.nama.org/amc/bon/carvir.html. Western Pacific NAMA will be hosting a Best of NAMA event at the VIP tent at the World Ag Expo in Tulare, CA. The event will be a reception/mixer from 12:30 – 2:00 p.m.
More details about the cost for this event are on the way. Visit www.nama.org/amc/bon/westpac.htm for the latest information. The ABEF Century Club, which was launched at the 2004 Agri-Marketing Conference in Kansas City, raised $2,100 at the 2009 Agri-Marketing Conference. Investing in the club provides the opportunity to step forward and help advance the future of agribusiness. Today’s youth are tomorrow’s leaders and the Century Club support is totally dedicated for investing in scholarships for tomorrow’s leaders. You can be a part of this select group of individuals committed to enhancing the opportunity for tomorrow’s leaders. The list below contains professionals who joined the Century Club by the end of the 2009 conference. Don’t be left out, sign yourself up now! Visit http://www.nama.org/abef/centuryclub/signup.htm. The new NAMA Job Network has moved to the Members Only Section of the NAMA web site. The job network was created to make it easy for you to post jobs. How it works? Simply visit http://www.nama.org/postjob.aspx to post your position, once you have submitted the position, it will be approved by the NAMA staff and will then be posted live. Please allow 24 hours for your job to be approved and posted live. To view the postings, just visit http://www.nama.org/membersonly.aspx and log in. Once logged in, scroll down to the NAMA Job Network and click on that link to view all postings. Please note, you must be a NAMA member to view postings, but you need not be a NAMA member to post a position. The Trends In Agriculture fall meeting is moving to Minneapolis this year! In addition, the dates have changed as well. The new dates for the 2010 Trends In Agriculture conference is October 5-6, at The Marquette Hotel in Minneapolis, MN. “We are very excited to host Trends in Agriculture in Minneapolis,” said Jenny Pickett, Executive Vice President/CEO of NAMA. “We have a large membership base there and it gives us a chance to expand our audience for the event,” says Pickett. The Best of NAMA regional judging will be November 9-10, 2010, at the Hyatt Regency Crown Center in Kansas City. The regional judging will take place prior to the National Association of Farm Broadcasting convention. Mark your calendars today for the 2010 Trends In Agriculture, October 5-6, in Minneapolis! Start making your plans now to attend the 2010 Agri-Marketing Conference, April 21-23, at the Hyatt Regency Crown Center in Kansas City. We’ve included the schedule at-a-glance for professionals and students below so you can easily plan your trip. The Region 2 Best of NAMA Ceremony took place on Thursday, January 7 at Boulevard Brewing in Kansas City, Missouri.